We’re in the midst of an indie revolution. Traditional publishing is challenged by those who are ‘doing it for themselves’ and by the people who are making it their business to do it for others, share what they know and help many of us to realise the dream of becoming successful self-published authors. And it’s all happening without the assistance of the traditional publisher. Guy Kawasaki and Shawn Welch recently co-authored, published and launched APE -Author, Publisher Entrepreneur – How to Publish a Book. While apes are usually associated with evolution, not revolution, this time it’s different. Detailing the trend they call ‘artisanal publishing’, their new book is a ‘how to’ guide for the indie author, outlining practical ways to best publish and promote the independent work, thus bypassing traditional publishing practices. While a handy guide on it’s own, this book is being used as the platform upon which revolutionaries Guy and Shawn stand to rally the indie author troops, inspire them and band them together to build their indie movement. Once it gains the requisite membership momentum, it will surely challenge the foundations of traditional publishing and be a formidable force of its own. Benefits to authors and readers alike should ultimately result. I will not sit idly by and watch this happen. I want to be an active part of the movement. I have some of my own revolutionary ideas on this that I’ll share in a future post so watch this space. Thankfully, I’ve already taken some steps to secure my place. I have embraced the roles of indie author, publisher and entrepreneur and am proud to discuss, defend and share my experiences. I have also been lucky enough to be in conversation with Guy and Shawn and was recently featured on a HOA for an APE Makeover on Google+ where they reviewed a number of indie works and provided feedback to us based on the principles they espouse in their book. For the full episode, aired originally on February 14, 2013 see the video below. 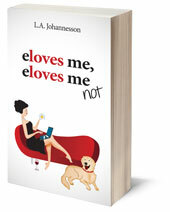 The detailed discussion of ‘eloves me, eloves me not‘ begins around the 44 minute mark. I found this a great experience where I received a few sincere compliments, some helpful tips and suggestions (a number of which have already been implemented) and the chance to meet others involved in creating change within this industry . Thanks to the Google-goodness, it was all achieved without even leaving the comforts of home. Yet another reason I’m becoming quite the Google+ fangirl!